In 1994, 24-year-old Kemba Smith was sentenced to 24.5 years in prison for her participation in her boyfriend’s illegal drug activities. She had no prior criminal record, and she was 7 months pregnant. Raised in a protective, middle-class community near Richmond, Virginia, Kemba Smith had spent four years in an abusive relationship with a man named Peter Hall. In 1989, Smith met Hall as a 19-year-old sophomore at Hampton University. He was eight years her senior and, unbeknownst to Smith, the leader of a $4 million crack cocaine ring and one of the FBI’s 15 Most Wanted. Their relationship was a tumultuous one. Smith made several unsuccessful attempts to leave Hall, who abused her physically and emotionally. When Hall was discovered murdered, the government held Smith accountable for the total amount of the drugs in his drug conspiracy charge. “I did not traffic in drugs, but I knew my boyfriend did. I knew while living with him that he did not have a job and we were living off of the proceeds of his drug crimes. I never claimed total innocence and this is the reason why I pled guilty,” Smith testified before the Inter American Commission on Human Rights in 2006. Due to mandatory minimum sentencing guidelines, the court was unable to take into consideration the fact that Smith had participated in Hall’s illegal activities, such as delivering money to his associates, out of fear for her life. Despite being a first-time, non-violent offender, Smith was sentenced to 24 years in prison. Like Smith, a rapidly increasing number of women are given excessive prison sentences as a result of their affiliations with male counterparts where they’ve served as mules, couriers, or gofers. Out of a sense of loyalty, many women refuse to testify against their spouses and partners. In addition, more than half of the women in state prisons have suffered physical or sexual abuse. Smith’s story garnered nationwide attention and was prominently featured in campaigns to expose the inadequacy of U.S. drug policy. For years, Smith’s parents, who were raising her son while she was incarcerated, galvanized a tireless seeking clemency for their daughter. After spending six and half years in prison, Smith was granted clemency in December 2000 by President Clinton. Unfortunately, many women do not have access to these kinds of resources. “My burden is that I represent the thousands of others still currently incarcerated; some are my friends who I left behind that deserve an opportunity to raise their children,” says Smith. More than 60% of women in state prisons have a child under age 18. 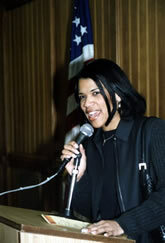 Since her release, Smith has earned a bachelor’s degree in social work and a law degree from the Howard University School of Law. She has received many awards for her advocacy and activism, and she uses her personal story to educate others about the social, economic and political consequences of our nation’s punitive drug policies.